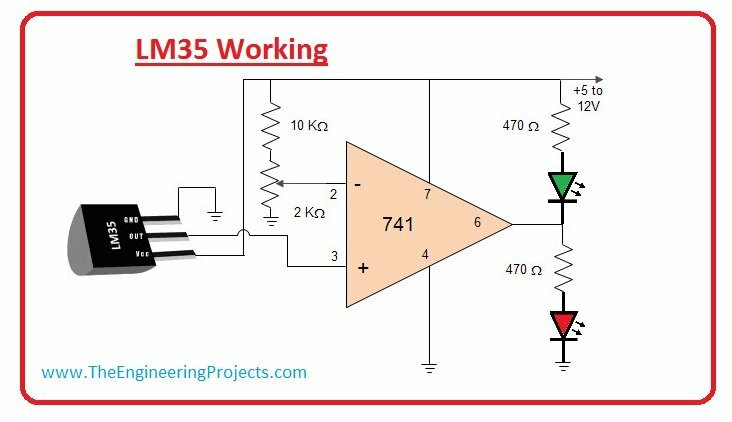 A complete step by step tutorial on Introduction to LM35. Hello friends, I hope you all are doing great. In today’s tutorial, we are gonna have a look at detailed Introduction to LM35. 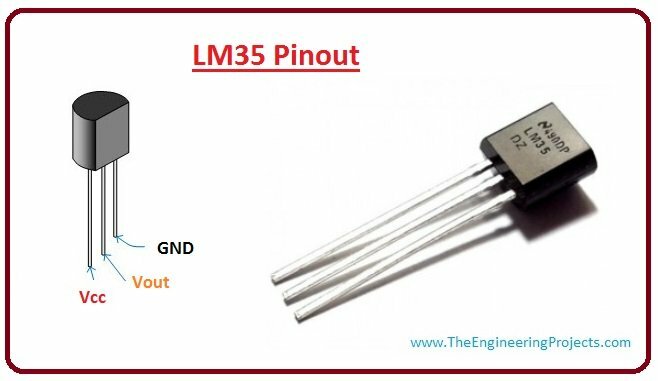 LM35 is a type of commonly used temperature sensor, that can be used to measure temperature with an electrical output comparative to the temperature in (°C). In can measure temperature in a better way then thermistor. LM35 is a commonly used temperature sensor, It shows values in the form of output voltages instead of degree Celsius. LM35 shows high voltage values than thermocouples and may not need that the output voltage is amplified. The output voltage of LM35 is proportional to the Celsius temperature. The scale factor is .01 V/°C. One most important characteristic is that it draws just 60 microamps from its supply and acquires a low self-heating capacity. LM35 temperature sensor available in many different packages like T0-46 metal transistor-like package, TO-92 plastic transistor-like package, 8-lead surface mount SO-8 small outline package. PIN 1: Vcc, it used as input at this pin we apply +5 V input voltage. PIN 2: At this pin, we get output voltage. PIN 3: This pin is used for ground. For better understanding lets, have a look at LM35 Pinout figure. Let’s have a look at working of LM35 Working. LM35 is used to measure precise centigrade temperature. The output of this sensor changes describes the linearity. The output voltages of this sensor are linearly comparative to the Celsius temperature. The output voltage range of this sensor is from -55˚ to +150˚C. It also has low self-heating power. Its operating voltages is 4 to 30 volts. In the most circuit, this sensor is used with an operational amplifier. An amplifier is a device which amplifies applied a voltage at a certain level. Operational Amplifier has three terminal, first two are inverting and noninverting inputs third one is used for output. By using LM35 with operational amplifier we can get amplification of output voltages of LM35. For better understanding lets have a look at circuit diagram. Its maximum and minimum input voltages are 35 V and -2 V respectively. It typically operates at 5 V.
It can measure temperature from -55°C to 150°C. Its Output voltage is directly proportional (Linear) to temperature (i.e.) there will be a rise of 10mV (0.01V) for every 1°C rise in temperature. Its Drain current is less than 60 uA. It is small and hence suitable for remote applications. It is available in TO-92, TO-220, TO-CAN and SO IC package. It is low self-heating, 0.08 C in still air n Non-linearity only ±1⁄4C typical. The project which we are gonna discuss is Temperature Monitoring on Virtual Terminal of Arduino. Temperature Sensor we are gonna use is LM35. In this circuit, Aurdino is the main component because it controls all functions. In this circuit LM35 senses the temperature and converts into an electoral (analog) signal, then this signal applied to Microelectronic Unit through an analog-to-digital converter (ADC). The analog signal is converted into digital format by the ADC. The value of temperature sensed by the sensor will be displayed on Serial Terminal or virtual Terminal if you are working on Proteus. 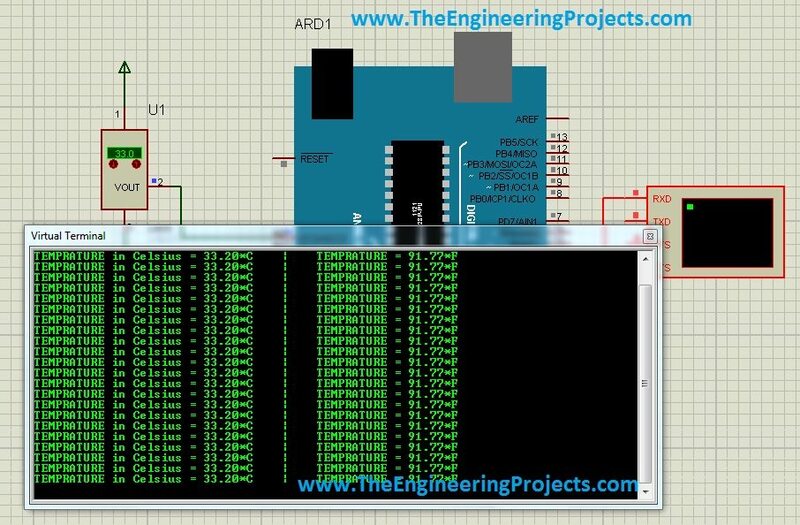 You can download this complete Proteus simulation from Interfacing of LM35 with Arduino in Proteus. I have also shared Interfacing of LM35 with PIC Microcontroller, so if you are working on PIC Microcontroller then you should read that out. Now, let’s discuss the advantage and application of this project. These are some applications of LM35, let discuss them. It’s used for measuring the temperature of a particular environment. It provides thermal shutdown for a circuit or component used in a specific project. It can be used for battery temperature measurement. It provides battery protection from overheating. It can be used in HVAC applications as a temperature measurement device.